What is the Houston Every Kid in a Park Program (EKIP Houston)? The National Park Foundation awarded Houston a grant to provide field trip transportation funds for 4th grade students in Houston area schools during the 2017 - 2018 academic school year. All Title I schools within Region 4 are eligible for these funds. We recommend teachers book trips as soon as possible. Field trips book quickly. 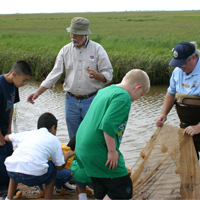 The EKIP Houston program collaborates with area national, state, and local partners and organizations throughout the Greater Houston Area to provide a wide variety of curriculum based natural, cultural, and historical field trips that are correlated with the Texas Essential Knowledge and Skills (TEKS). Finding a Field Trip Opportunity is Easy: Educators can browse a map displaying various field trip locations, choose one that correlates with their curriculum needs, find instructions on booking a field trip, and learn how to receive transportation reimbursement at the EKIP Houston Website. For teachers who may not be able to attend an in person field trip to one of our sites, we encourage you to participate in a Virtually WILD field trip, available through the Region 4 website, on a variety of TEKS-correlated nature-based adventures, that connect students to nature.